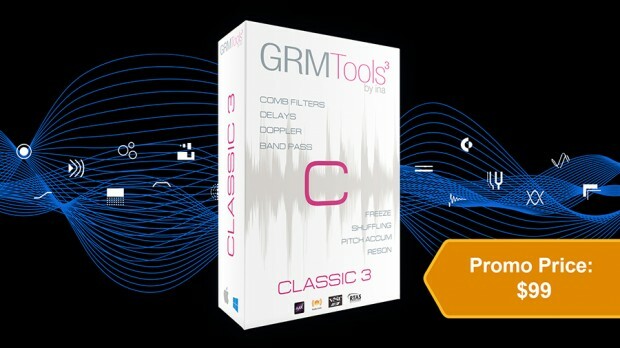 The GRM Classic 3 collection of plug-ins have been used by renowned artists and sound designers around the world. During the month of September you will able to purchase it for only $99, a saving of “50% off” the list price ($199). GRM have been at the forefront of unique technologies and design for over two decades, creating exquisite plug-ins mainly used in the post-production film work by the likes of Skywalker Sound and other facilities in use on your favourite films to-date (inc. the successful 2015 release, Mad Max – Fury Road). This entry was posted in Audio Software, DontCrack, Plug-ins, Promotions and tagged Band Pass, Classic 3, Comb Filters, delays, Doppler, Freeze, GRM, GRM Classic 3 collection, ina GRM, Pitch Accum, Reson, Shuffling. Bookmark the permalink.